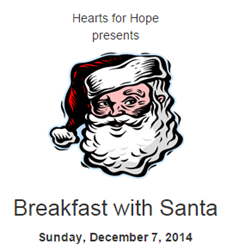 Mancari’s of Oak Lawn is excited to announce their sponsorship of the annual Breakfast with Santa, being held this Sunday December 7th to benefit Hearts for Hope programs at Advocate Children’s Hospital of Oak Lawn. The event will take place at Ridge Country Club, located at 10522 S. California Ave. Chicago IL. The Mancari's family is proud to support Hearts for Hope organization and Advocate Children’s Hospital. They do great work in the Oak Lawn community. Breakfast seatings are available at 9:00 am, or at 12:00 noon and tickets are $20 for children and $28 for adults. Children under age 2 are free. Guests can look forward to a full breakfast buffet, pictures with Santa, storyteller fun, and much more! Please bring a new, unwrapped toy for the children at the Hope Pavilion. "The Mancari's family is proud to support Hearts for Hope organization and Advocate Children’s Hospital. They do great work in the Oak Lawn community. We have supported this event for several years now, and hope to see a big turnout for a great cause at this fun, festive event!" said Ed Tapper, Sales Manager at Mancari's of Oak Lawn. Proceeds from this event benefit the Hearts for Hope programs at Advocate Children's Hospital - Oak Lawn. Tickets can be reserved online at http://www.advocatehealth.com/santa. HEARTS FOR HOPE was established in 1998 by grateful parents, concerned families, and business leaders in our community to raise both awareness and funds for Advocate Hope Children’s Hospital. Advocate Children's Hospital - Oak Lawn offers care to every patient who comes through its doors. Hearts for Hope makes positive impacts in the lives of patients and their families through hands-on volunteering and involvement. They help create a child-centered environment of compassion, comfort and healing inside the doors of the Hope Pavilion. Hearts for Hope plans and executes a variety of special events throughout the year including a major golf outing, Halloween Bash, patient parties, Savanah’s lunch box and a breakfast with Santa. As one of the largest Chrysler Jeep Dodge RAM dealerships in the Chicagoland area, Mancari’s of Oak Lawn has served Illinois loyally for more than 45 years with some of the highest customer satisfaction ratings in the automotive industry. For more information visit us today at 4630 W 95th Street, Oak Lawn, IL 60453 or at http://www.mancari.com. You can also become a fan of Mancari's by liking our Facebook page.